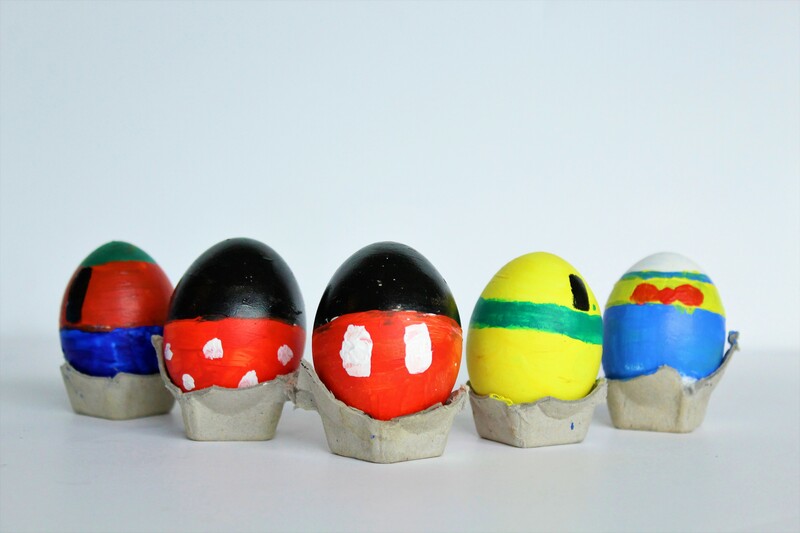 Recently I had so much fun doing the egg hunts at Disneyland Resort, that I wanted to re-create the fun at home! I wanted to make Easter eggs that had the bright colors of the Fab 5 characters (Mickey Mouse, Minnie Mouse, Goofy, Pluto, and Donald Duck). To do that, I used acrylic paints to do bold colorblocking on my eggs that resembled the colors of these classic Disney characters. Since my daughter is already familiar with using paints on arts and crafts we do at home, she was able to help paint these Fab 5 colorblock creations. -Small and medium paint brush. At most craft stores you can find sets that come with small tubes of all these colors. 1. Before painting, draw lines with a pencil lightly around your eggs to help you paint in a straight line. For example, for Mickey, you would draw a line around the egg in the middle, to help you see where to paint Mickey in black and where to paint him in red. 2. Squirt small amounts of your acrylic paint colors on a plate. 3. Using your medium brush, paint the color block colors onto each of your eggs. 4. Allow the egg’s main colors to dry by placing them standing in an egg carton before you paint on the smaller details. 4. Using your small paint brush, paint on the smaller details of your character eggs (i.e. Minnie’s polka dots, Goofy’s and Pluto’s ears, and Donald’s bowtie). 5. Place your eggs standing in your egg carton to allow to dry thoroughly before using them for egg hunting fun!